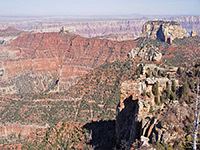 Atoko and Naji are two points either end of an eastwards-projecting section of the Walhalla Plateau, where the road moves away from the rim for several miles putting this part of the Grand Canyon out of sight from casual observers. But both are reachable by walking off trail through the forest, and (together with Cape Final), offer a rather different perspective of the gorge compared with the other overlooks closer to the highway - the views here are of the canyon around the junction with the Little Colorado River, backed by the unbroken flat expanse of the Painted Desert and the Navajo Indian Reservation. 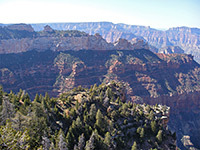 The point can be seen when driving south where the road briefly runs right along the canyon rim, 1.3 miles from the pull out at Roosevelt Point. The nearest suitable parking area for the hike seems to be a short distance beyond, as the highway straightens out - opposite the junction with a disused forest track (hard to spot), the roadside verge is wide enough for vehicles. The route is then simply through the woods in a straight line for 1.5 miles northeast, mostly within sight of the rim except for the first section which encounters dense forest, partially fire damaged. The land is level to start with but then slopes down into a flat-floored valley where the trees are more spread out, and the canyon edge comes into view to the north. The woodland on the far side of the ravine is more severely burned hence the terrain is now quite open, and walking easy apart from a few clumps of prickly bushes that block the way. The last part of the hike is slightly downhill, as far as the projecting terrace of Kaibab limestone that forms the actual point. Close by, an unmarked route descends several bands of cliffs then leads down into a side canyon of Kwagunt Creek, eventually reaching the Colorado River after 8 miles. Atoko has good views north towards Roosevelt Point and the tall ridge extending eastwards, encompassing white-topped Tritle Peak, at the same height as the plateau, and four red buttes at successively lower elevation (Colter, Swilling, Hutton and Duppa). 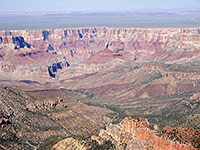 Ehrenberg Point is visible beyond, and in the distance the narrowing Grand Canyon extends many miles further north, between the hazy Vermilion and Echo Cliffs. In the east, Atoko Point overlooks the wide, undulating Kwagunt Valley, in front of the narrow east rim, the vertical cliffs of Desert Facade, and a vast area of flat desert stretching to the horizon. Even the dark outline of Navajo Mountain is discernible on a clear day, over 100 miles away. The watchtower at Desert View can just be glimpsed to the south, above another long red ridge centered on Siegfried Pyre.